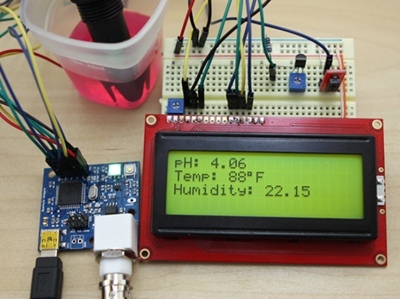 LeoPhi is arduino-based pH sensor with USB interface. It can be used as standalone sensor or be part of another embedded system. The project settled on the USB enabled Atmega32u4, which is a fully USB compatible, with 2.5k of RAM and 32K of flash. It is also the chosen MCU for the Arduino Leonardo and allows users a lot of flexibility in adding pH reading and control to any project. Since the release of the Leonardo and Arduino1.0.1 it is very easy to use and program this unit to match whatever a project demands.